Prepare for a bit of ramble – but I wanted to share the photos as an accountability thing for me and possibly to help others struggling. I left out a lot of details because there are others that have newer and more helpful info – but if you have a question, please feel free to ask. You can contact me from the form. Eight years ago I was prepping for bariatric surgery. Now, after all of it – would I recommend it? If you are serious about making a lifestyle change and if you are sure that you genuinely have put forth every effort and still are struggling. YES. Otherwise, no. It is not a quick fix; it is not — let me repeat that IT IS NOT the easy way out. 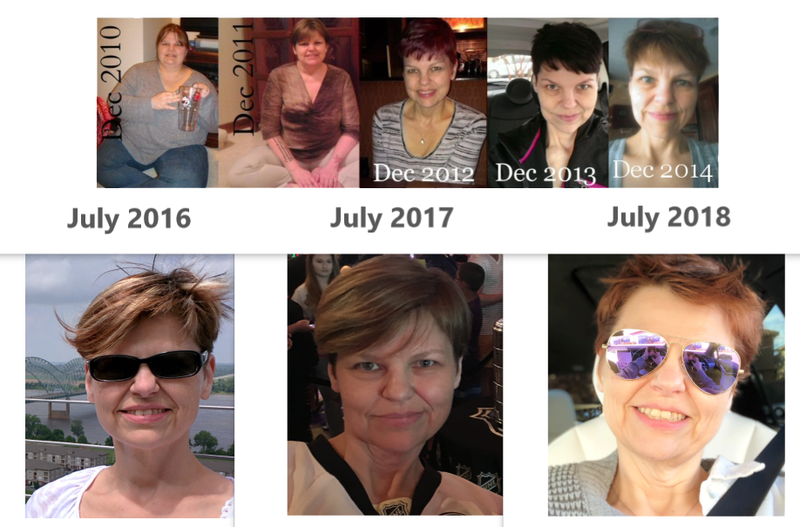 I had the Gastric Bypass – Roux en Y in March 2011. In March 2010, we took a road trip to CA. We stopped along the way to visit friends. Between my weight and fibromyalgia, I had a mobility scooter. I was miserable if I had to walk more than 100 feet. I had to miss out on several places because I couldn’t make the trek up the stairs or I would not fit in the tiny seats. Miserable I tell you. When we returned from the trip, and I was sorting the images. I realized then, and there I had to do something! I did a lot of research. I read books; I chatted with others who had the surgery and contacted a reputable surgeon. I was on my way. It took eight months from walking in the door for my first consult to surgery date. It was a whirlwind. I had psychiatric appointments; I had blood work, I had to meet with a support group. After the first two months of the intro to this process, I had to adhere to a weight loss plan. I had to be able to lose 25 lbs before I would be ready to go under the knife. During that time I stuck to my plan – no matter how painful it was. It was so hard to train myself to eat healthier foods when in the back of my head was that voice – “just order the milkshake, this is the LAST milkshake you will ever have” – “oh fries, yes please – this will be the LAST time I can have fries” — you get the idea. I was mourning the loss of comfort foods; I was trying to let go of the warm and fuzzy feelings you get when you are stuffing your mouth with grandma’s biscuits. It was a very trying time for me. I was thankful that during my recovery, Michael cooked his food. It was the complete opposite of being tempted, the smells and visual cues of the food was just more than my newly sensitive stomach could bear. It took me about six months to make my way up to being able to eat a small handful of food in one sitting. Cut to 8 years later. I’ve learned my thinking I would never have delicious foods again was not only a major mental stressor, but it was also unnecessary; I have had fries and the rare milkshake. The key for me has been a drastic modification process. It helps that I don’t crave the same foods that I did before the surgery. I have also learned that if I have a craving for a specific food, I let it linger for a bit and if it doesn’t go away after a few days, I let myself have it. It gives me comfort to know that if I want it that no food is off the table forever, and that has made binge mentality disappear. I lost a lot of weight during the first 13 months – by 18 months I had lost 205 pounds – by the 3-year mark I had gained some back, and here at eight years, I am still under the goal weight set for me, and more importantly, I feel better. When I was in the 130s I was miserable every time I looked into the mirror. Sagging skin and I thought I looked sickly. In a short amount of time, I went from 24US jeans to 4US jeans. It was a whirlwind for sure. I am a student of life, a traveler, a dog mom, a cat servant, and a dreamer. I try to be very open and honest about my life – the good and the bad. I used to fight my demons, but we’ve joined forces to work our way through this life. I participate in the Amazon Services LLC Associates Program, an affiliate advertising program designed to provide a means for sites to earn commissions by linking to Amazon; this means if you purchase an item from an Amazon link on my website, I get a modest commission. I use these funds to buy tea, books, and pens. You can visit my Amazon Shop directly if you’d like.